Reason for inclusion: I had never seen an Ernst Lubitsch film. 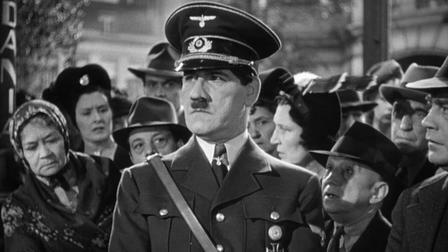 While watching To Be or Not to Be, I couldn’t help but be amazed that such a bold political satire (and spoof of the Nazis) was filmed and released during the thick of World War II in 1942. Here is a film that pulls no punches, even including multiple Hitlers, cracking jokes about a real-life horrifying situation. Yet most astonishingly, it remains tasteful. The film takes place in Warsaw during the Nazi occupation, and it follows a Polish theater company caught in the middle of it. Josef Tura (Jack Benny) and his wife, Maria (Carole Lombard, in what is tragically her last role), are the biggest names on the bill, but both have such out of control egos that they bicker back-and-forth more often than not. Their rocky relationship leads Maria to fall for a starstruck young pilot named Stanislav Sobinski (a 23-year-old Robert Stack), who has been sending her flowers during her shows. Sobinski leaves Warsaw to join the fight against the Nazis, but he eventually returns on a top secret mission to find a possible spy. This traitor, Professor Siletsky (Stanley Ridges), attempts to recruit Maria to join the Nazi cause. 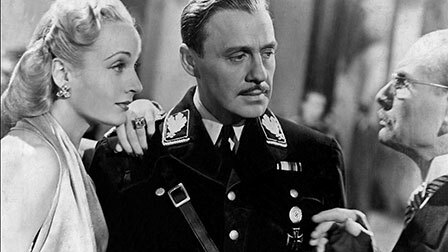 At this point, the film gets more and more farcical, as the theatrical group becomes entangled between the two sides, with many of the actors posing as important members of the Nazi regime. While it can get a bit tricky following the surprisingly complex plot, especially as there are multiple people playing both the “real” and “fake” versions of the same character, it all comes together quite nicely in the end. 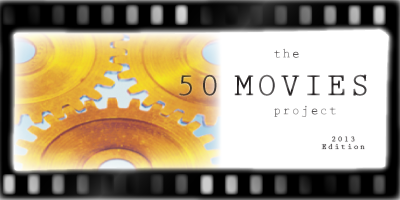 What I loved most about the film is how it combines so many different genres and ideals. Take a political satire, throw in a bit of screwball comedy, a dash of startlingly effective suspense, and some romance, and the end result is masterful. To Be or Not to Be represents a number of firsts for me. 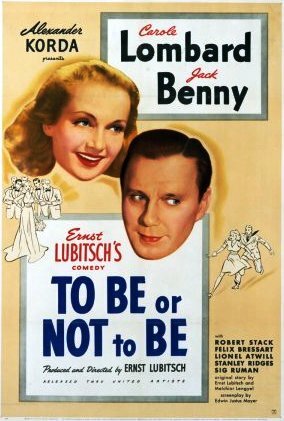 Not only is this my first Lubitsch (and certainly not the last), but it is also the first I have seen from either of its co-stars, Jack Benny and Carole Lombard. Benny is someone I have heard a lot about over the years, and his hammy, over-the-top performance in this is great fun. Lombard is the perfect counterpart, both stunning in appearance and quick with her tongue. They are both ripe with razor sharp dialogue, and each member of their theater group is given their chance to shine as well. I’m waiting for my Criterion Collection disc to finally arrive this month. Great film. I bet the Criterion release is incredible. Nice one, Michael! This sounds like an excellent film, great review. I will be checking this out, or I will be adding it to the ever increasing list of films I want to see..
Ernst Luibitsch is a master of elegance, subtlety, sometime racy and scathing for its time humor. A early forerunner of the Howard Hawks rapid fire and layered dialogue so taken for granted today. ‘To Be or Not to Be’ is merry, near madcap comedy in the time of war. Right up there with Chaplin’s ‘The Great Dictator’. Thanks, Jack! What’s your personal favorite Lubitsch film? Trying to figure out what I should see next. It’s kind of a triple play between ‘Trouble in Paradise’ from 1932. ‘The Merry Widow’ two years later. Or ‘Ninotchka’ from 1939. With ‘Trouble in Paradise’ being the raciest for its time. Inching out ‘Ninotchka’, which is the most accessible and re-made. Much appreciated, Jack! Looking forward to checking those out. Great review, Eric. I need to check this one out myself; it sounds like it could be a pretty good satire. *putting it down in my LONG list of films to see* thanks for NOT collaborating in keeping the list manageable Eric. Haha, I know that feeling all too well. Thanks, Niels. Great review Eric. As you know I have a looooong list of classic films I still need to see and this is one of them! Cheers, Ruth — this one will not disappoint!